Top Div. III Class - R.V. 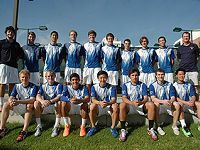 Who's interested in playing for Pomona-Pitzer? The following articles are relevant to the Pomona-Pitzer men's team. The University of Chicago men captured the first ITA Division III National Team Indoor title in program history on Sunday, defeating three-time defending champion Emory 5-3 in Cleveland, Ohio. Emory had eliminated UChicago the previous three years.